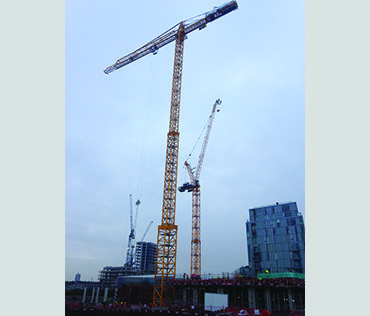 One of the world’s tallest freestanding tower cranes will soon commence install of Elements Europe’s Room Modules at a residential development in Greenwich. At its highest point the crane, which is the first in the world from Jaso is 98m tall and capable of lifting 24T. The crane will install all 653 modules which make up some of the 249 one and two bed apartments. Each apartment will be made up of two to three modules linked together at install stage. The crane will also install the modular corridor cassettes and roof structure for the scheme. The 23 storey development will be one of the tallest residential buildings in the UK to be built using modular construction and is Britain’s first modular build to rent scheme. Essential Living is developing this scheme to attract families. Careful thought has gone into creating family friendly living spaces and added amenities such as buggy store, nursery and underground parking. Lower income households will also benefit as the council has been designated one quarter of the apartments to be discounted.